Dolomite Mountains s.r.l. creates unique, active outdoor experiences in Northern Italy’s Dolomites and Beyond. We craft the ultimate custom adventures for the most exclusive clientele, who demand stylish, low impact programs with outstanding quality and value. Our roots are in the Dolomites, one of the most beautiful mountain landscapes on Earth. The Dolomites’ vertical walls and long, narrow valleys provide an unparalleled location for hiking, biking, climbing, and skiing – and much more! One of the only local Italian tour operators based here, Dolomite Mountains has the benefit of local knowledge and expertise unlike any other. We provide authentic experiences so our guests can explore and enjoy the real Dolomites, taking in local culture and inspired regional and gourmet cuisine, in addition to the vast panoramas and trails. We combine the beauty of the incredible Dolomites landscape, a UNESCO World Heritage Site, with accommodations that best reflect the style of the area. We partner with our hotels and mountain inns to provide guests with the ultimate, personal experience. And our passionate, expert guides not only hail from and live in the region, but hold the highest international certifications, and love sharing insights that extend beyond what other companies offer. We live here, we work here, we know this place – but we also love to travel and explore! Now you can join us Beyond the Dolomites with pre-and post- trip extensions to Venice, Verona, and Lake Garda; adventures in Sardinia, Rome, and Florence; active vacations in the Austrian and Swiss Alps; and exclusive horseback riding trips in Argentina’s Northern Patagonia, on our founders’ family Estancia. At Dolomite Mountains, we have an active adventure for everyone! With an incredible variety of diverse landscapes, lush valleys, breathtaking panoramas, and friendly inhabitants, the Dolomites are the “crown jewel” of the Alps. From soaring peaks to elegant spires to sheer rock faces, the Dolomites offer endless opportunities for exploration and adventure. This unique corner of the Alps features numerous valleys, ideal for a wide range of outdoor adventures. From the charming Italian atmosphere of the Ampezzo region to the green pastures of the Dolomiti di Sesto and Alta Badia to the towering peaks of the Val de Fassa and Val Gardena regions, this world-renowned mountain terrain offers something for every type of adventure traveler. Hiking, biking, skiing, snowshoeing, rock climbing, or climbing a via ferrata – the Dolomites have an adventure for everyone! The Dolomite Mountains staff works year round refining our services to ensure we offer the best trips possible in the Dolomites. We combine this with accommodations that best reflect the style of the area, inspired regional cuisine, expert local guides with international certifications, and the best panoramas you can get in the Dolomites. We're here so you can relax and enjoy the pleasures of wandering in the Dolomites, while we take care of the details of travel, luggage handling, and all other logistics. Dolomite Mountains Company Video 2016 from Dolomite Mountains on Vimeo. Agustina Lagos Marmol is a multilingual world traveler, adventurer, climber, and devout hiker. She has traveled and lived in various countries, but her heart is shared between the Dolomites, where she currently lives, and Patagonia, where she grew up fly fishing and horseback riding on her family's estancia. Before entering the world of travel, Agustina studied photography and fashion design in California. In 1994, she discovered the Dolomites while working for a Canadian-based travel company, which led her to settle down in this magical part of the world and start her own outdoor company: Dolomites Mountains s.r.l. Kimberly Beck Rubio has been part of the Dolomite Mountains team since fall 2009, and serves as copywriter, editor, marketing consultant, and photographer. An avid hiker – and a former ski patroller, whitewater raft guide, and climber – she honed her outdoor and adventure travel skills through years of working in the outdoor industry and in adventure travel. She has held management and executive roles at The North Face and Mountain Travel Sobek, and holds two degrees from UCLA – a BA in design and an MBA. She currently lives in the San Francisco Bay Area of California. A passionate world traveler, Kim began traveling and photographing with her father when she was eight years old. Thus far she has visited five of the seven continents, and has visited Italy – her favorite country and part of her heritage – nine times. Today a professional photographer and marketing consultant, she traded in her “desk job” almost a decade ago to order to focus on her creative and outdoor pursuits. “Combining my passion for adventure and being able to open that door for others has always thrilled me… whether sparking an interest in them through the written word or through incredible images, my goal is to open people’s eyes to what is out there and inspire them to explore the world.” Kim recently celebrated her wedding anniversary in Italy with her husband, realizing the dream of "sharing my favorite place in the word with him – the glorious Dolomites!" Monika Valentini joined Dolomite Mountains in the fall of 2011, and manages our client reservations and communications, and several marketing activities. She has a great knowledge of the Dolomites and travel through hands on experience, a business degree, and her passion for travel and meeting people from different cultures. Monika is a native of the Dolomites and currently resides in Alta Badia. She studied tourism management in the economics department at the University of Venice “Cà Foscari,” and graduated with excellence. Prior to joining Dolomite Mountains, she held roles as an assistant marketing manager for a ski resort, and for a company that produces and distributes natural beauty, wellness, and health products on both national and international markets. Monika is a passionate traveler herself, and loves to hike, mountain bike, play volleyball, and, of course, to ski. She has been skiing since she was four – she grew up in Alta Badia, the number one ski resort in the South Tyrol after all! Anna Cozzi has been with Dolomite Mountains since June of 2012, and as copy manager, manages all of our incredible itineraries. A native of Milan, she earned her degree at the University of Bologna in Arts, Music, Theatre, and Communication. Since graduation she has worked in various cities throughout northern Italy, including Montalcino where she was the marketing and communications manager for a winery, Bormio as a translator for the Alpine Ski World Championships web site, Torino where she was the communication manager for the 2006 Winter Olympics Torch Relay, and in Milan organizing culinary events to promote the culture of food and beverage as an “educational” tradition of Italy. While her mother tongue is Italian, Anna’s English is so well practiced that upon meeting her you would think she hailed from the United States! Add to that, she is also fluent in German and Spanish! During her time at University, she moved to New York for four months, where she studied for exams and helped some friends learn Italian. No doubt she refined her English speaking skills here. Anna currently lives in the Dolomites and loves to hike. When she is not out playing in these mountains, or with her two dogs, she enjoys scuba diving, as well as knitting and patchwork. Sarah Alfreider has been part of the Dolomite Mountains team since November 2013. She assists the office in tracking client reservations, and booking their accommodations, guides, transfers, and other services included in their itineraries. 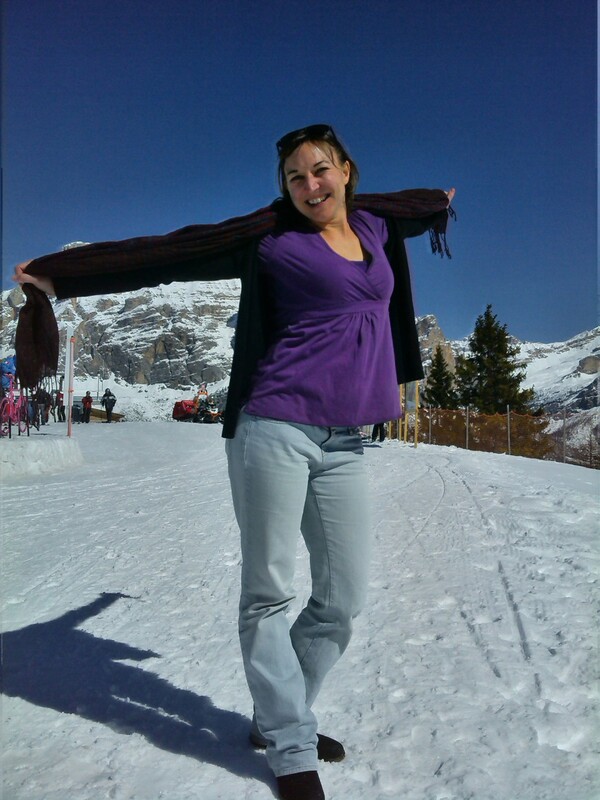 Sarah grew up in the Dolomites in Alta Badia, and lives in Corvara in Alta Badia with her family. She attended the language high school in La Villa, where she refined her fluency in Italian, German, the native Ladin, French, and English. She hopes someday to have the opportunity to add Portuguese to this list! She has lots of experience in tourism in the Dolomites, having worked as receptionist at a 5-Star hotel in Alta Badia, at the Corvara ski school office, and at the Tourist Office in Corvara, organizing events and helping guests by providing area information. During her free time, she enjoys reading, cooking, shopping, dancing, swimming, time with friends, and of course, hiking and skiing. Since the fall of 2011, Sarah has danced with the Ladin folk group of Val Badia, which gives 20-25 performances each summer at exhibition halls, festivals, and parades. A lover of travel, Sarah visits a new destination every year without fail. She says it “is something I can’t miss in my life. The different cultures, languages, populations and traditions of the world fascinate me.” Sarah has traveled extensively through Italy and Western Europe, as well as Indonesia, Egypt, the Dominican Republic, Mexico, and Cuba. Beyond the Dolomites, one of her favorite places is Lake Garda, which she tries to visit twice per year. Future visits to the USA and Australia are on her list, with a dream of going to India to see the Taj Mahal. During her trips, Sarah loves to combine luxury and adventure, relaxation and culture, gastronomy and sport. Christin Clara joined the Dolomite Mountains team in April 2016; her background made her a perfect fit for the company! She grew up in the northern part of the Dolomites on a farm, and has always loved the mountains and nature. Throughout her childhood, her parents were always involved in tourism, which is where her interest originated. She went on to study tourism management the Free University of Bolzano, as well as studying web design, social media, and online marketing. While she was a student, she pursued employment in tourism, working in several hotels in the Dolomites before joining Dolomite Mountains. Today Christin continues to live in the Dolomites, just north of Alta Badia, and plays the flauto traverse (Western concert flute) in the band in her village. She loves outdoor sporting activities, including biking, hiking, climbing, skiing, and, especially, climbing via ferrata. Her favorite is Via Ferrata Lipella on the Tofane di Rozes above Cortina d'Ampezzo. She loves this long, challenging climb for the various terrain that it covers, and the different kinds of climbing it requires: a tunnel, ledge traverse, with a final steep push. Additionally, when she finds free time, she also likes reading and dancing. Maria Cristina Gravina joined Dolomite Mountains in 2014, and provides trip briefings to our guests upon arrival. She was born in the Dolomites, and has played in these mountains her entire life. She began skiing at the young age of 3, and has hiked here forever, starting with her active parents when she was just a little girl. Its no wonder two of her favorite things to do today are ski and hike! For 10 years, beginning at the age of 15, Cristina competed on the Italian National Ski Team. She was a participant in the World Championship in Garmisch, Germany, and the 1980 Winter Olympics in Lake Placid, USA. With 10 years of downhill skiing World Cup Races in the late 1970s and early 1980s, she was ranked one of the 15 best female downhill skiers in the world for several years. She followed her skiing career with 15 years of skydiving all around the world. Cristina completed more than 1,000 jumps from 3,962 meters (13,000'), including participating in some large formations during free fall. In the winter, Cristina is both an Alpine and Telemark Skiing instructor, specializing in freeride skiing. In the summer she is a hiking guide, and also works at a Paragliding-Tandem Center in Alta Badia. She fluent in English, Italian, German, and Ladin (a minority language recognized in parts of the Dolomites). Sara Folegani has been part of Dolomite Mountains since April 2016, and works with the team as a sales assistant. She was born in Ferrara, a lovely city in the northeast of Italy, between Bologna and Venice. While she is not a native of the Dolomites, she is a world traveler, and loves the blue sky and the green mountains of this incredible landscape where she now resides. From her upbringing, this seems to have been her destiny! When she was just 6, she started “suffering the city.” Thanks to her parents who transmitted the passion for travel to her, she started moving all around Italy, Europe, and, as young as 19, working all over the world. Her travels have included Spain, Ireland, Hungary, the U.S.A., and Sri Lanka. In her mid-20s, Sara moved to Alta Badia, and has remained here for more than a decade, enjoying the vast landscapes and outdoor activities. 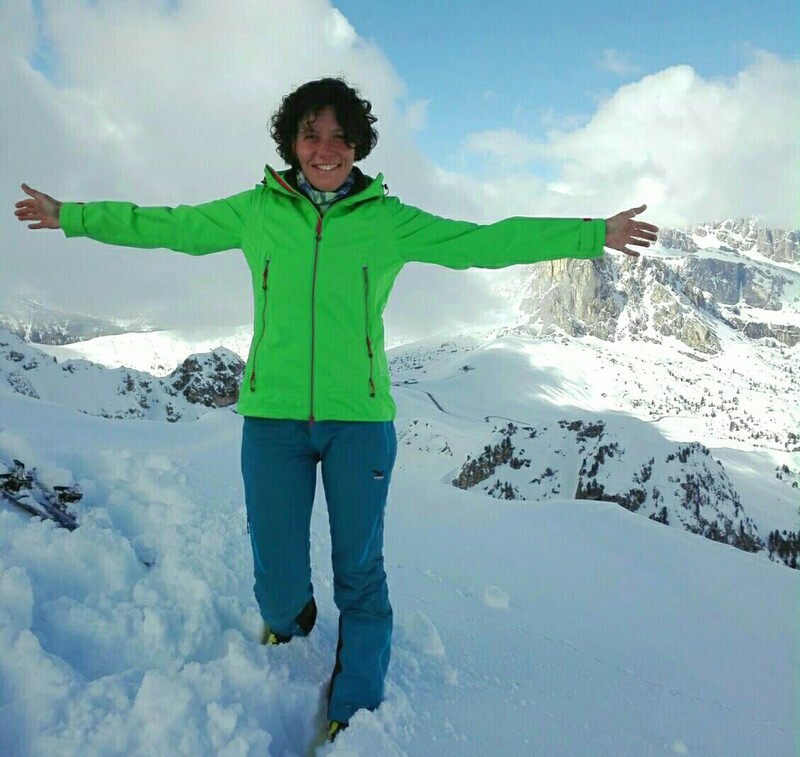 S ara Della Torre is the newest addition to our team, joining Dolomite Mountains in April 17. Born in the outskirts of Milan, Sara lived there with her family and attended trade and language school. At age 19, She decided to spend a few months in the UK to learn English. This evolved into 13 wonderful years of extensive travel and experiences throughout the country, and ultimately worldwide. In 2002, Sara started working in the tourism industry for a selection of London based tour operators that specialized in tailor made travel. It was during this time that Sara grew increasingly passionate about the travel industry. After years of office-based jobs, she decided to lead groups and assist clients during the holidays abroad and for a number of years she has been based in the Dolomites. During her free time Sara loves reading books, spending time in the mountains, catching up with friends, listening to non-mainstream music, and keeping up to date with international press related to sustainable projects worldwide. Sara speaks fluent English, Spanish, and Italian, plus French at conversational level. In the last two decades: Sara has travelled extensively across Cuba; spent 6 months traveling in Central and South America; crossed the Southern states of the USA; backpacked through Thailand, Laos, Cambodia, India, and Nepal; and let's not forget a long list of European destinations. Among the countries Sara has visited, she feels a strong connection with South America, which she would like to visit again. Not surprisingly, the list of places she wants to visit is constantly growing! For more information on booking your hiking, biking, climbing, skiing, or luxury vacation in the Dolomites, please contact us.